​ Reparation is the ideal of our religious community. Though the countless sins of mankind continually scourge our Lord in the Blessed Sacrament, they cannot deafen the compassionate sighs and pleadings of His Immaculate Mother and her beloved children. 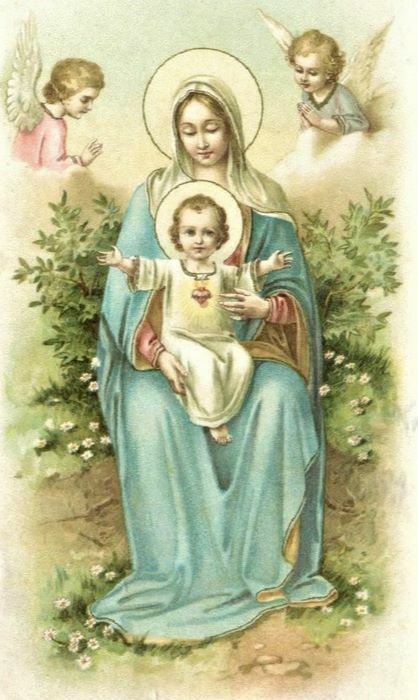 Therefore, we confidently place all our actions in the hands of our Blessed Mother, trusting that she will offer them, together with her own merits, to the wounded Heart of her son. Ora et Labora is the two-fold spirit of our religious family. We unite under the patronage of Our Holy Father, Saint Benedict, utilizing both his Holy Rule and wise balance of prayer and work. The spirit of a family thrives in the house as long as his Holy Rule thrives in the hearts of our sisters. Bound together by the same ideal of holiness, we become all for all: We give all by generously sacrificing ourselves for one another along the journey to perfection in the spirit of Christ-like love. We receive all by sharing in every grace that is shed upon this religious family through the intercession of Our Blessed Mother and our Holy Father, Saint Benedict. Our chief apostolate is that of the Divine Office. Through this sublime act of vocal prayer, we unite with our Holy Mother the Church in glorifying Almighty God, submitting to His holy will, pleading for the expiation of sin, and continuously asking Our Lord to bestow blessings upon mankind. We currently pray the seven hours of the Monastic Breviary: Lauds through Compline, striving to express its ancient beauty by utilizing the monastic modes and psalm tones. With prayerful longing, we look forward to offering the night vigil of Matins, which requires the vigilance of additional voices. It is then that the Work of God will have reached its complete state of majesty and splendor. Aside from the Divine Office, we also gather for our weekly holy hour, during which we recall Our Blessed Mother, whose suffering is most painful due to sins committed by her Priests. To these, her chosen sons, she has entrusted the very heart of her existence, the Body and Blood of Jesus Christ. And yet too often, this Immaculate One is betrayed by the very hands that were ordained to please her. What utter desolation she must endure when one of these, her beloved, is lost! It is our calling then, to honor and console Our Good Mother by offering reparation for these beloved souls, and by praying for both their salvation and sanctification. Let us comfort Our Blessed Lady, let us seek the chosen souls of her Priests. Work is both a joy and a prayer; both body and soul are raised to God when we seek Him in the call of duty. Our active apostolate includes visiting the sick and elderly, and instructing young souls in their Catholic Faith by teaching Sunday Catechism classes. Through these works of mercy, we apply our contemplative spirit of prayer to those who need it most: to youth, who’s spiritual horizon is just beginning to dawn, and to the sick and elderly, who seek encouragement and perhaps a reaffirming word, recalling that our Catholic Faith is the greatest security in this life and our greatest glory in the next. Work within the convent includes general activities such as cooking, cleaning, and yard work. We also apply ourselves to sewing, needle-work, painting, crafting, music-practice, archery and other similar activities.